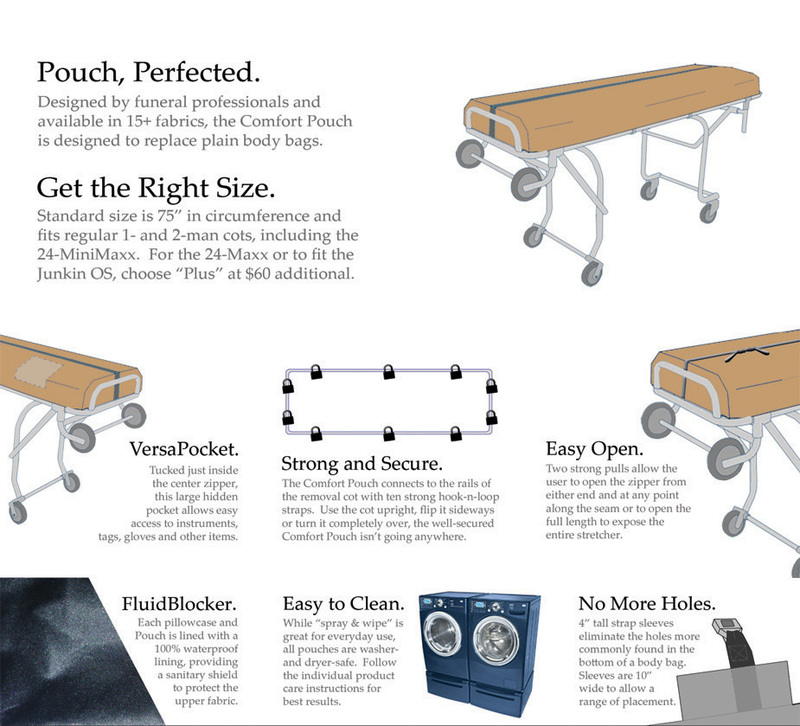 Comfort Pouches from Final Embrace are designed to dress up your removal stretcher while providing better utility than a standard zippered pouch. Featuring two zipper pulls, this pouch can be opened anywhere along the length of the zipper. Available in any of the 20+ fabrics in our collection, the Comfort Pouch is lined with our revolutionary FluidBlocker (tm) fabric to resist leaking. The entire pouch can be turned inside-out and cleaned with disinfectant. Each pouch also includes a hidden pocket for paperwork and other supplies, 4" sleeves that allow for multiple placements of the securing straps and a generous circumference of 75 inches for larger clients." Regular standard size is 75" in circumference and fits regular 1 and 2 man cots, including the 24-MiniMaxx. For the 24-Maxx or to fit the Junkin OS, choose PLUS at $60 additional. International orders may incur an additional shipping charge.